****The repair work originally scheduled for this Sunday, June 17 has been cancelled. The work will be rescheduled for a future date. 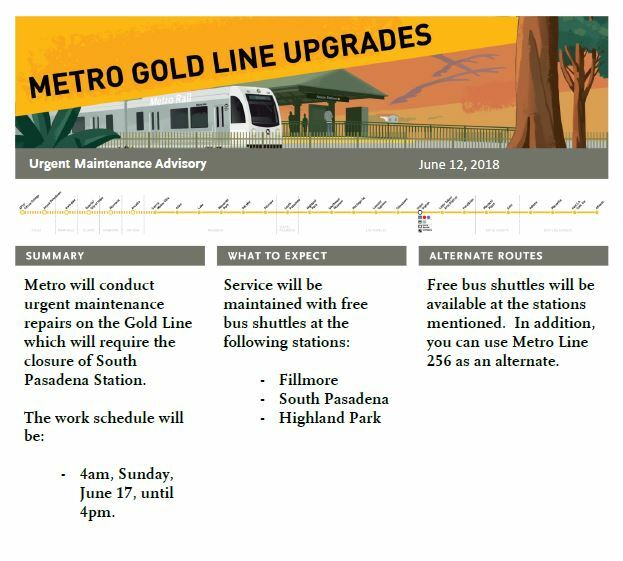 Repair work will take place on the Gold Line this Sunday, June 17. Crews will perform emergency track maintenance near South Pasadena Station. In order for crews to perform the work, there will be no train service to South Pasadena from start of service to 4 p.m. Sunday. Free bus shuttles will replace service between Fillmore and Highland Park throughout the closure. This means the last stop for all southbound trains will be Fillmore and the last stop for all northbound trains will be Highland Park. The Gold Line is slated to run a normal Sunday schedule arriving every 12 minutes and buses will match service levels as best as possible. Regular service will resume after 4 p.m. on Sunday. If you plan on using the Gold Line, please allow extra travel time for your transfer between the train and bus shuttles. Customers can also use Line 256 that runs along the Gold Line as an alternate option. Metro personnel will be on scene to lend assistance. As always, we appreciate your patience and understanding while work is in effect. For the latest service updates, be sure to follow us on Twitter @metroLAalerts. For routes and schedule information visit Metro.net or call 323.GOMETRO. Wise choice, considering there is a major event at the Rose Bowl this weekend. Would be great to have these repairs coordinated with those on the Metrolink SB Line so that they are not occurring on the same weekend.